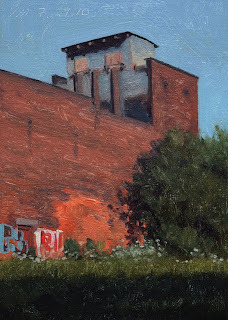 This daily painting is a downriver industrial landscape along the Rouge river. 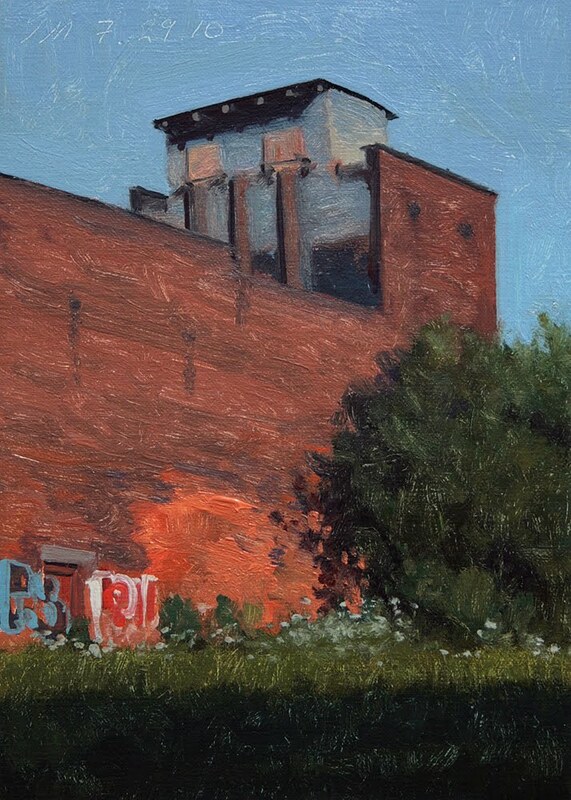 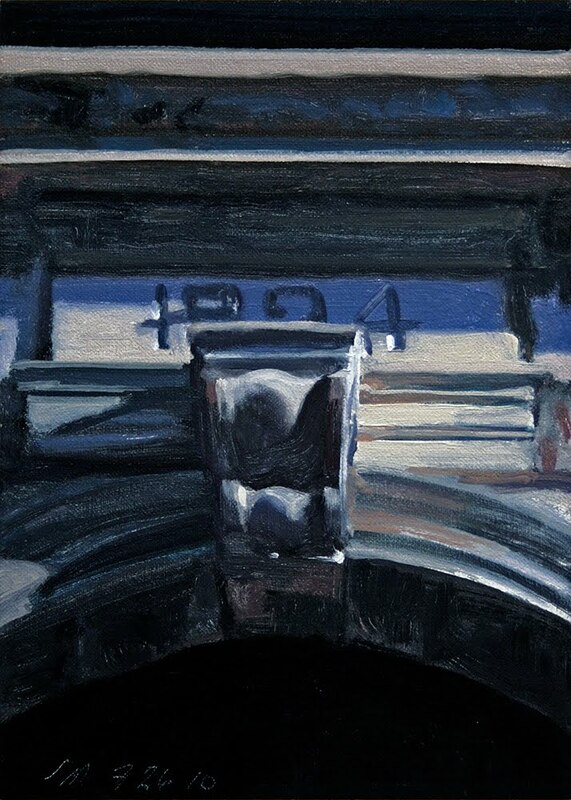 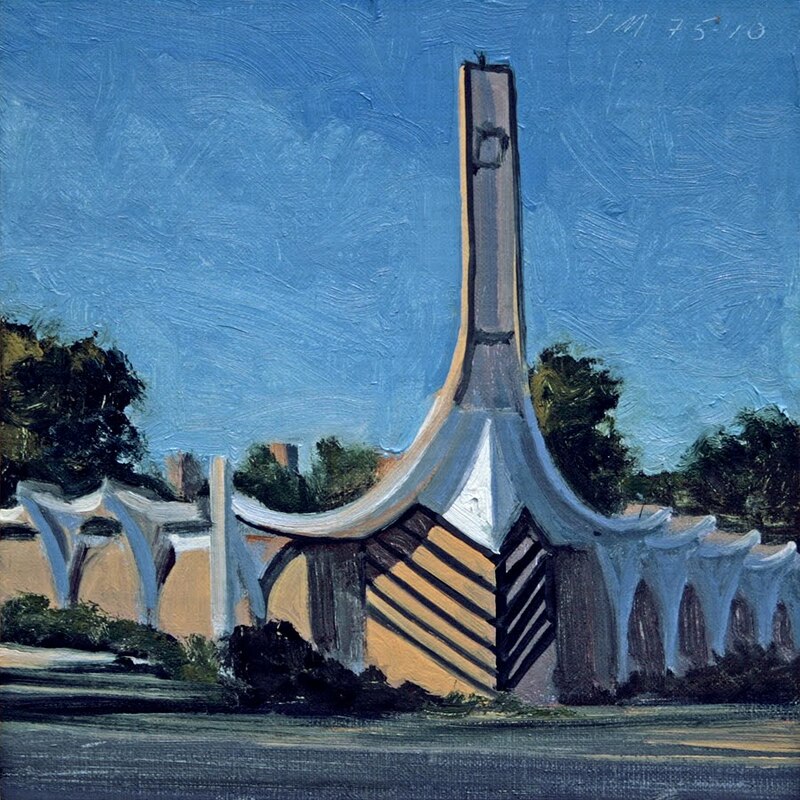 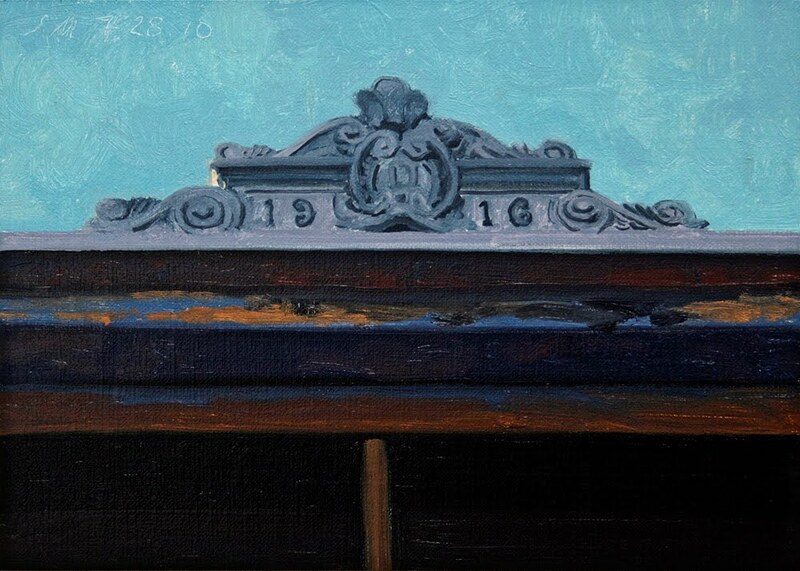 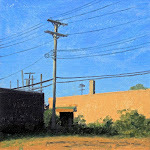 This daily painting is an architectural detail on a downriver building with early morning light. 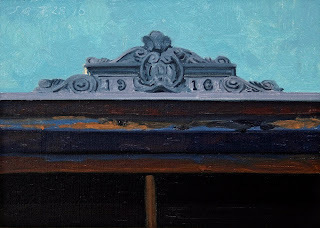 It is on W Jefferson Ave and was built in 1916. 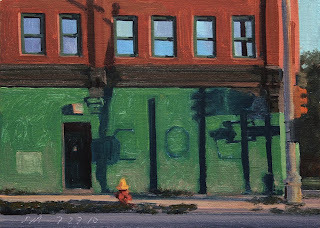 This daily painting is a view of a wonderful green building with long shadows and evening light on Michigan Ave.
SOLDThis daily painting is an architectural detail on a Midtown building with early morning light. 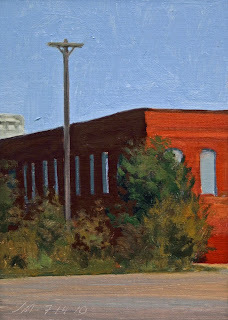 I was happy with the way this came out and think it would be fun to do a series of details from all over the city. 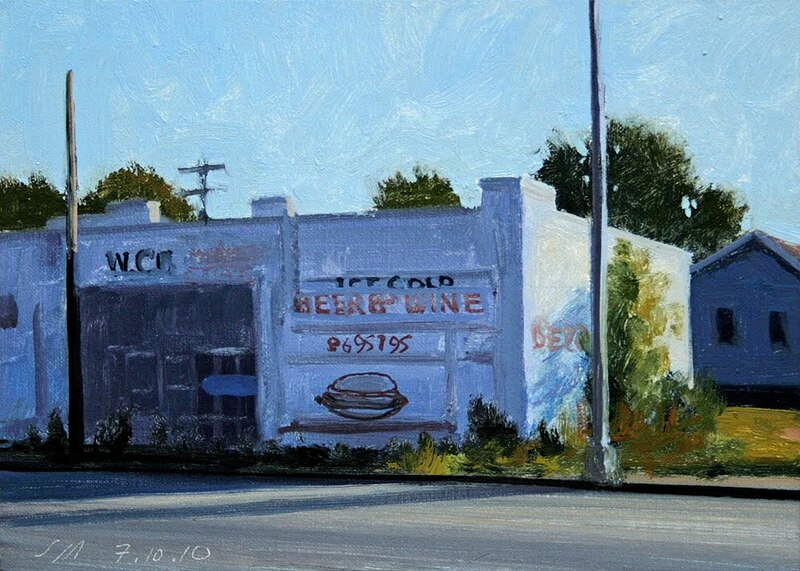 This daily painting is a view of the former Bill's Blue Star Lounge on Michigan Ave. 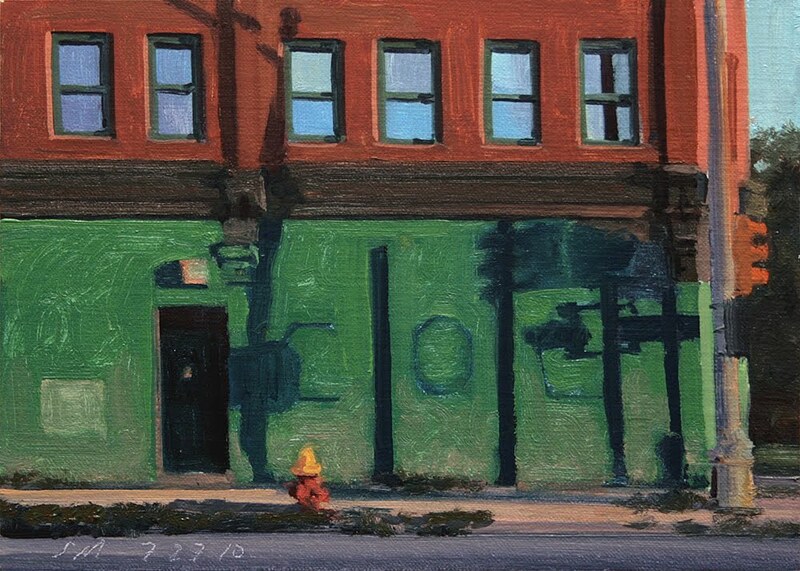 I have painted this building before, larger and a view of the corner, before it burned down. 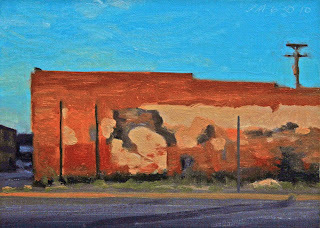 Another forgotten building. 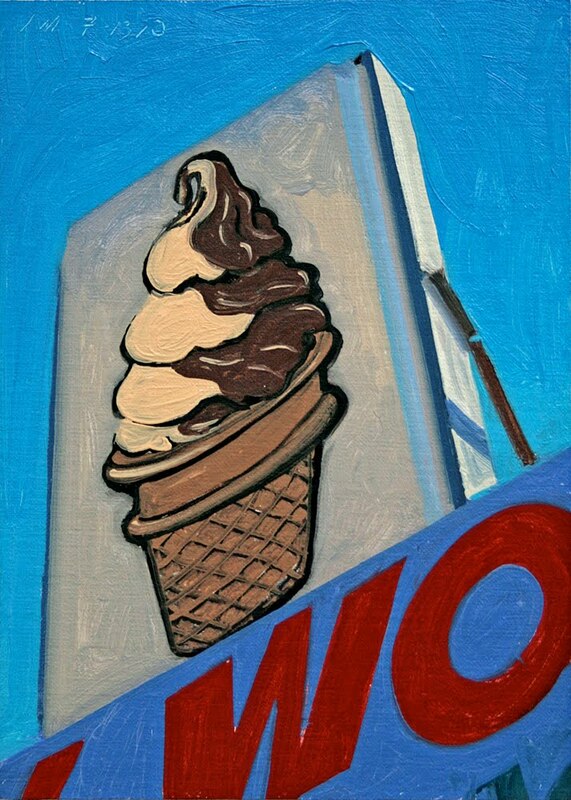 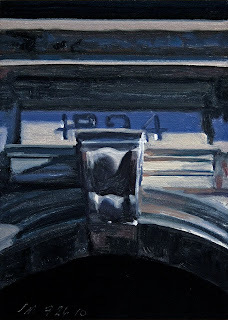 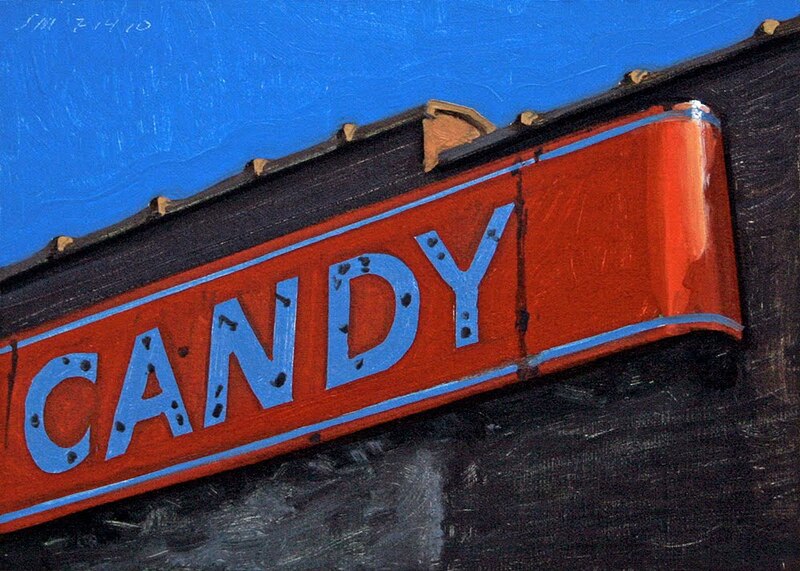 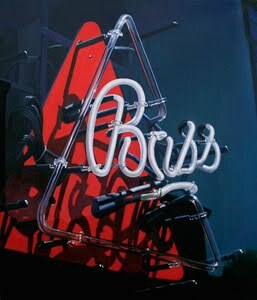 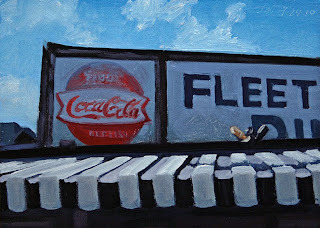 This daily painting is part of the sign for the Fleetwood Diner in Ann Arbor, MI. This is a very small classic diner. I may do a whole diner view as it is all stainless steel in a classic corner location. 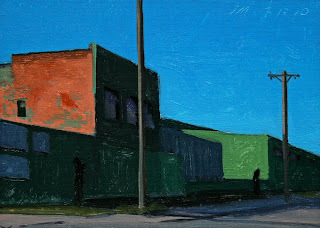 This daily painting is the ninth in the Detroit Vignette series of Detroit urban landscape paintings. 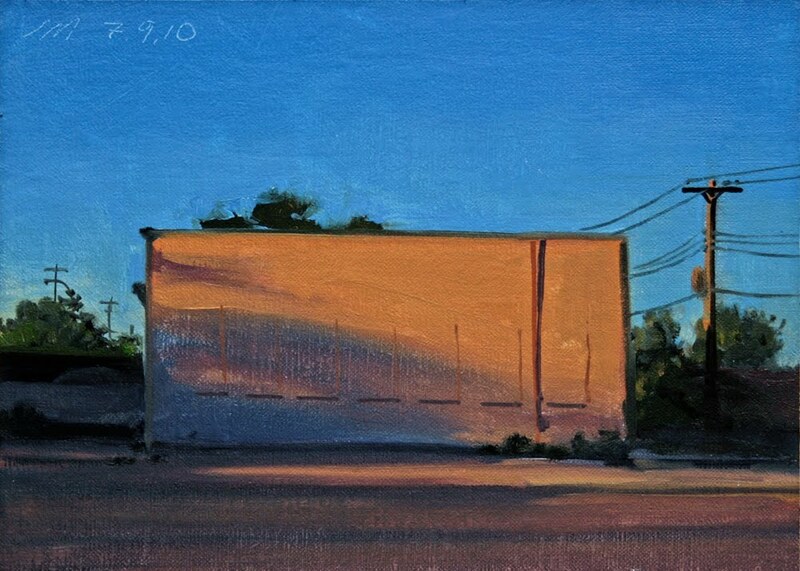 There is some mystery going on in this deceptively simple painting. 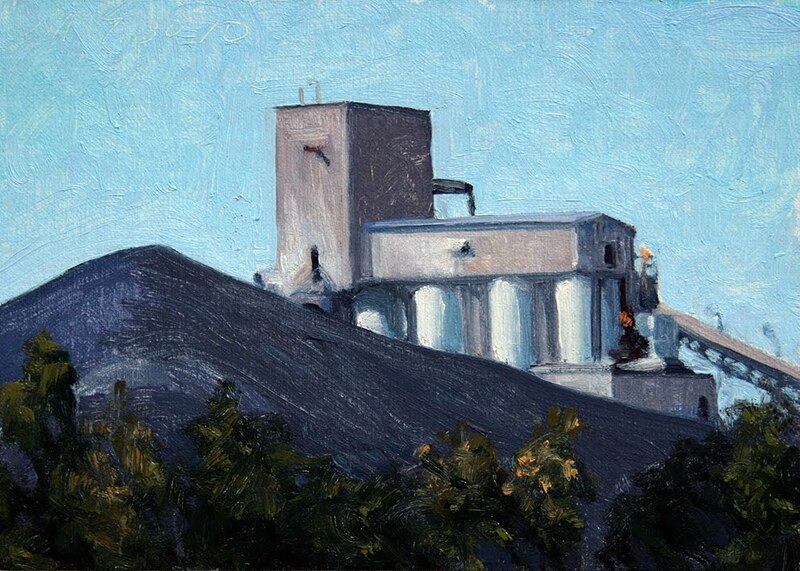 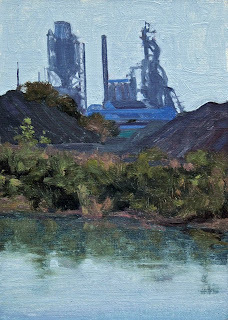 This daily painting is an industrial landscape of the the steel plant on Zug Island. 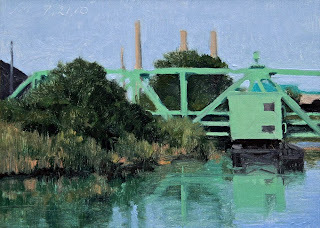 This is the island where yesterday's swing bridge connects to over the Rouge River. One thing I find very interesting is the water in this part of the Rouge always has an aqua tint to it, very unusual for an industrial area. This daily painting is an industrial landscape of the swing bridge over the Rouge River with reflections. 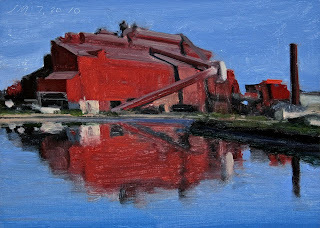 This daily painting is an industrial landscape of the Rouge Plant with reflections. 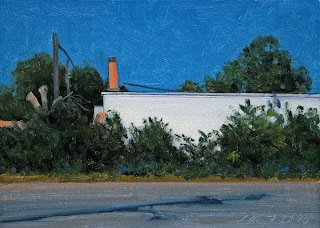 This daily painting is a view of a downriver house near the railroad tracks in early morning light. 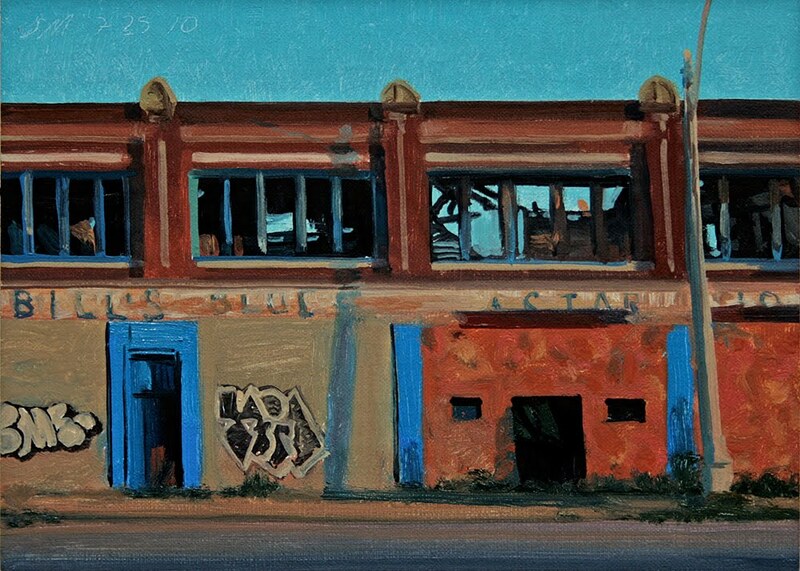 This daily painting is another abandoned building in Brush Park, it used to rent rooms. 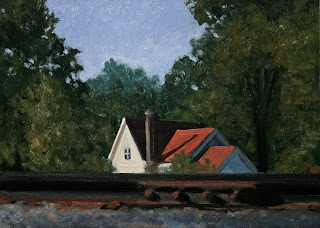 I went downriver today to shoot industrial scenes to paint. It is good to know Homeland Security is doing their job as they stopped me and made me delete about forty great shots of Great Lakes Steel that would have made wonderful paintings. 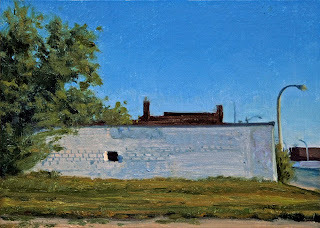 I understand, and he was very understanding about the whole thing, Oh well another day in Detroit. 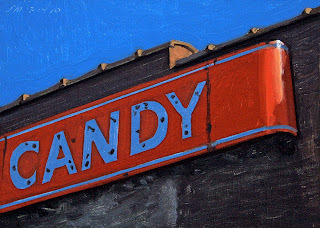 This daily painting is the sign for Dairy World next door to Dutch Girl Donuts on Woodward Ave. For your one stop sugar fix. 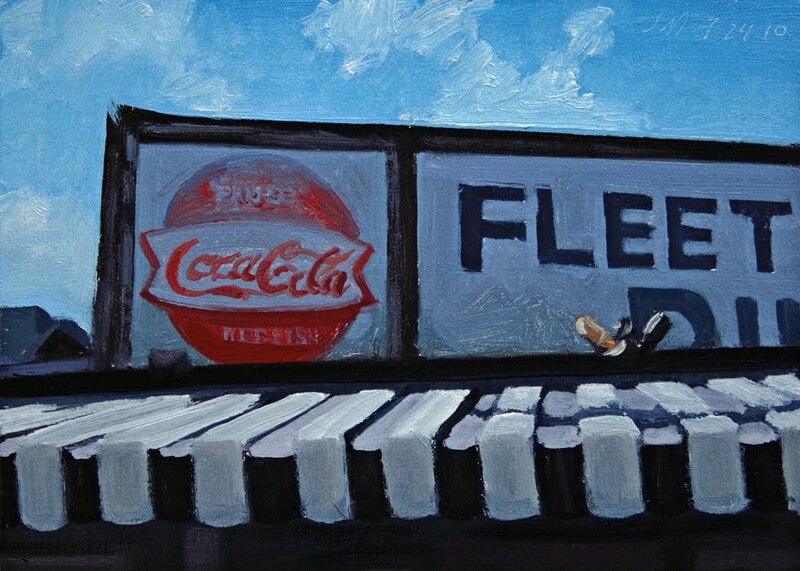 Thought I would lighten things up a little for today, enjoy. This daily painting is another abandoned building on Hamilton Street. 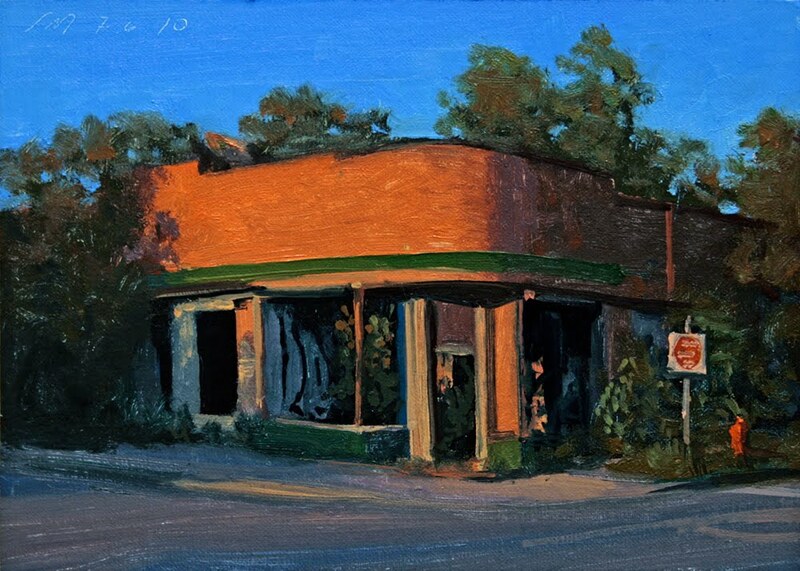 There are quite a few of these buildings with trees growing inside or on the outside indicating they have been vacant for some time. 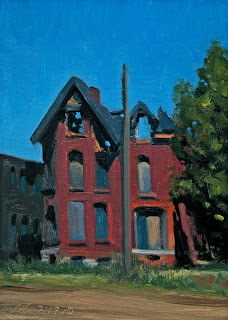 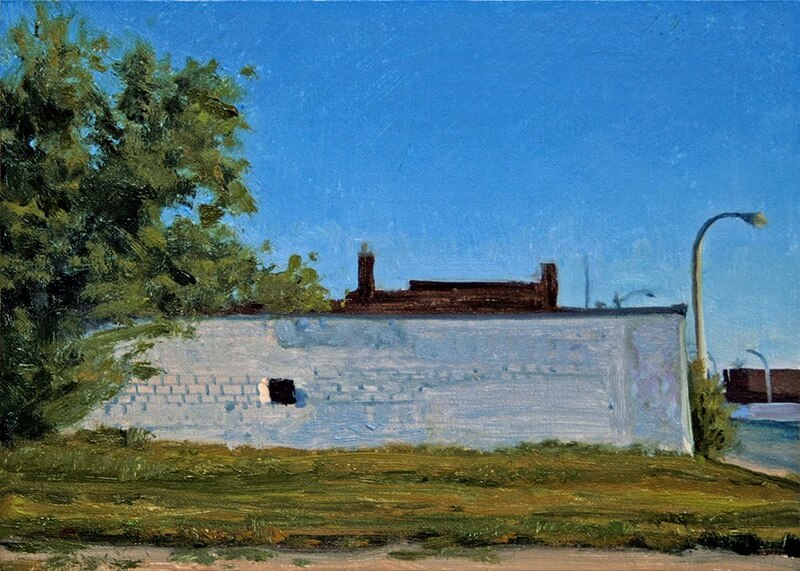 This daily painting is another abandoned building on 14th Street near the abandoned Michigan Central Station. 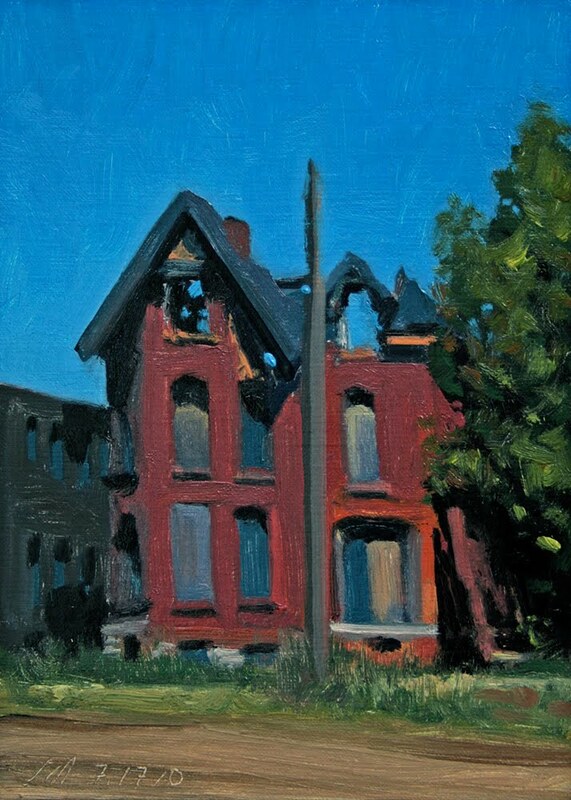 The house is also abandoned. 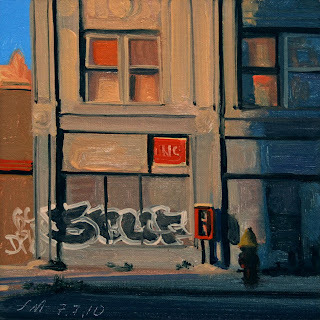 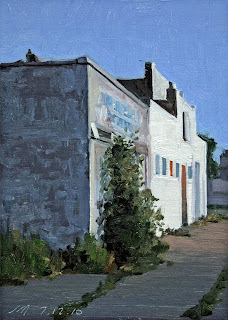 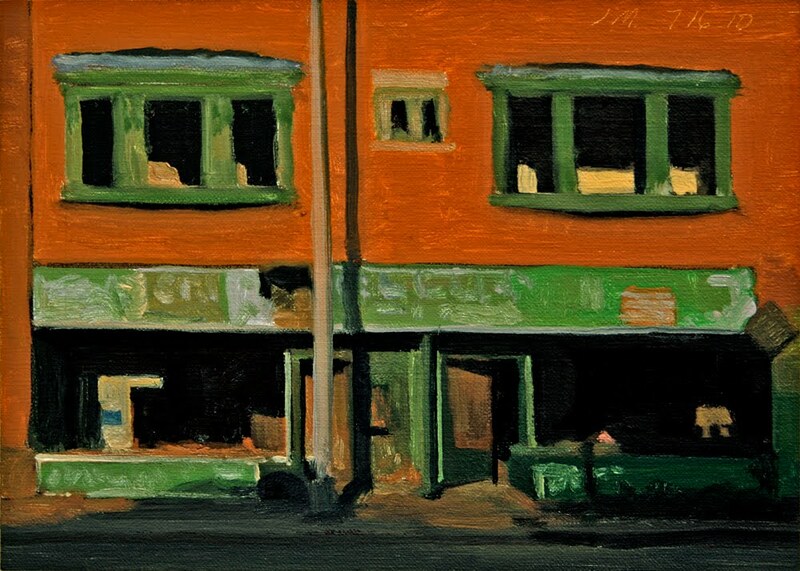 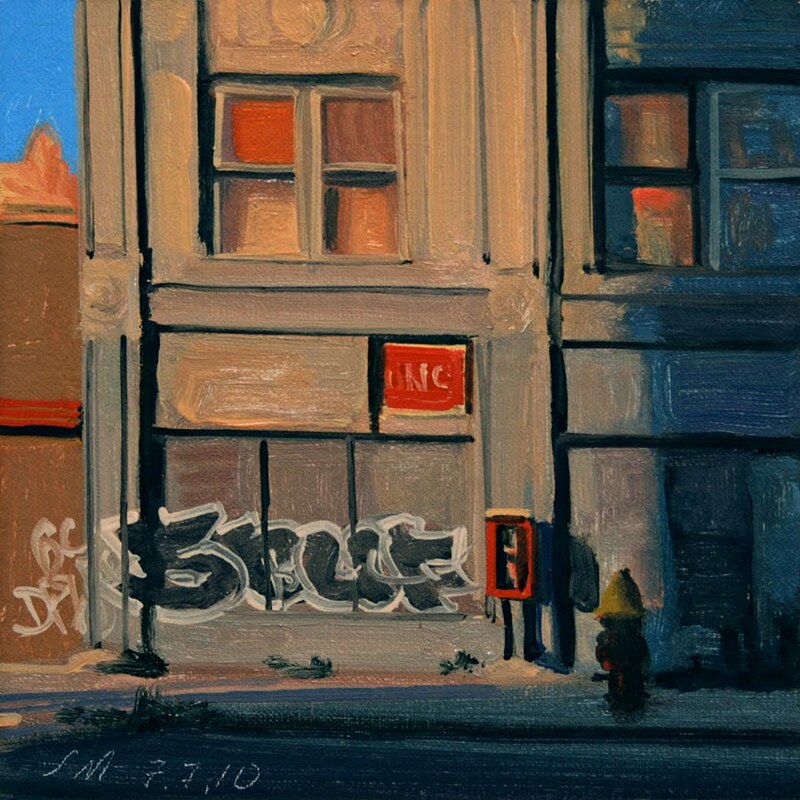 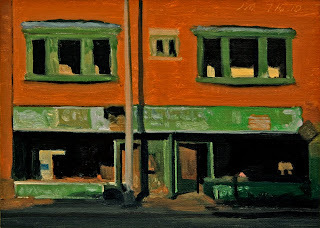 This daily painting is another Hamilton Street building in early morning sunlight and shadow. 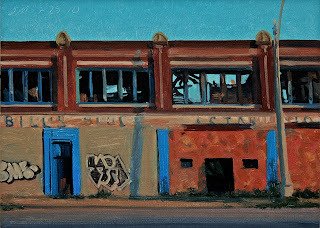 This daily painting is the seventh in the Detroit Vignette series of Detroit paintings. 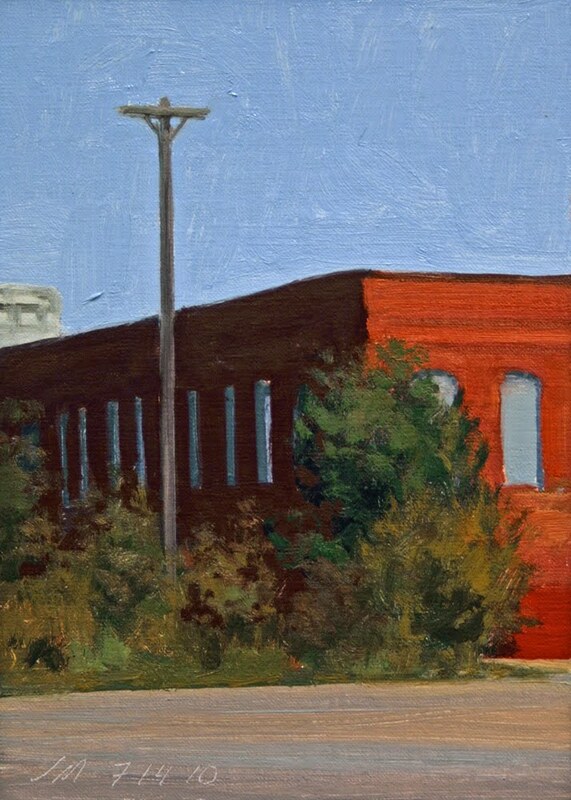 This building with the interesting shadows is off Hamilton Street. 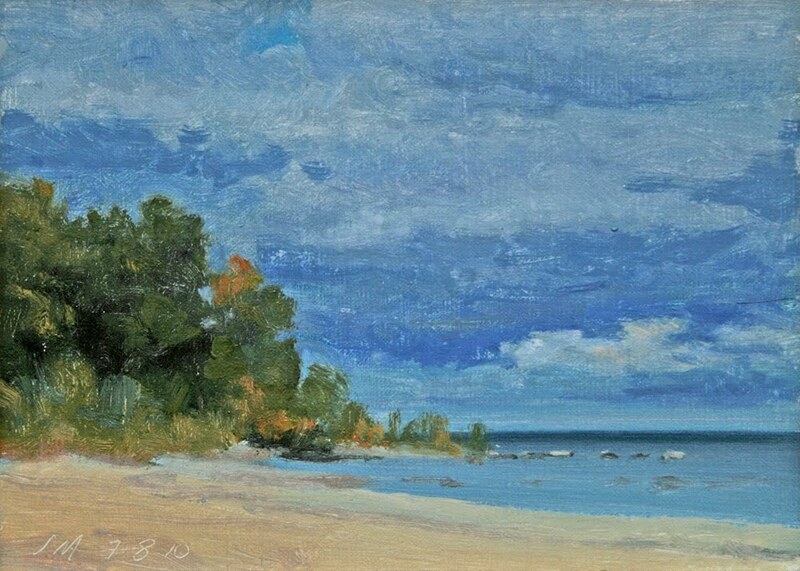 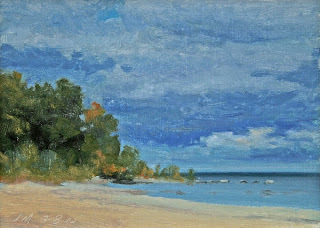 This daily painting is a landscape of the beautiful Lake Huron sore. It is north of Lexington. 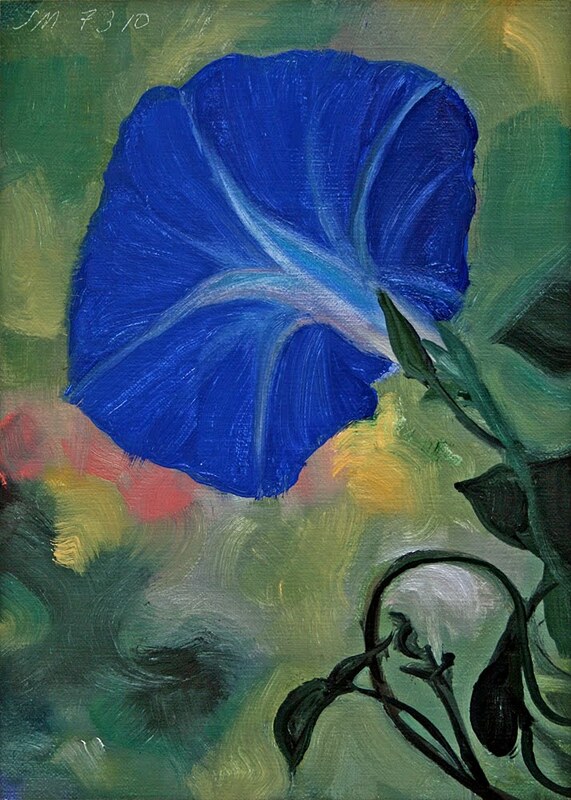 Oil on linen/panel, 2010, 6"x6"
This daily painting is the second I have done of the Morning Glories that are growing on my studio. I wish they lasted longer, as soon as the sun hits them they start to wilt, and new ones start fresh the next morning. This daily painting is the third of the Lake Michigan Dunes series. 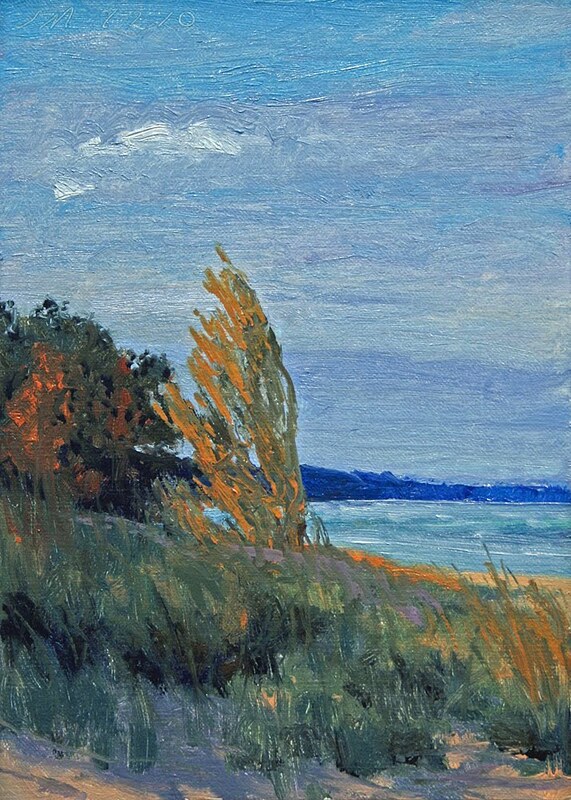 The dunes are North of Lakeside along Lake Michigan. 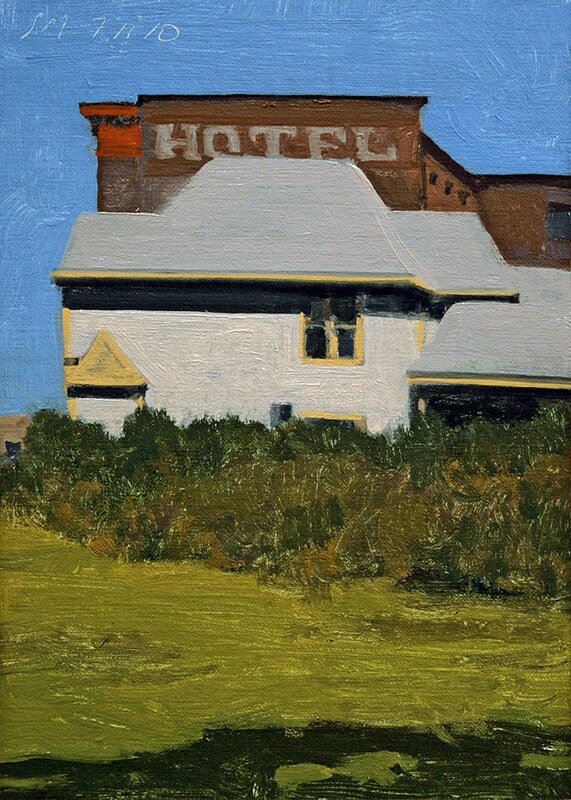 From our trip last year to the Lakeside Inn. 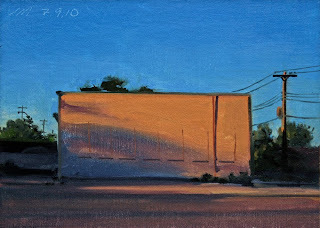 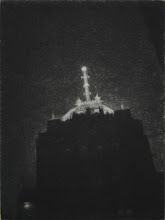 This daily painting is the fifty-ninth in the Citylights series of paintings. 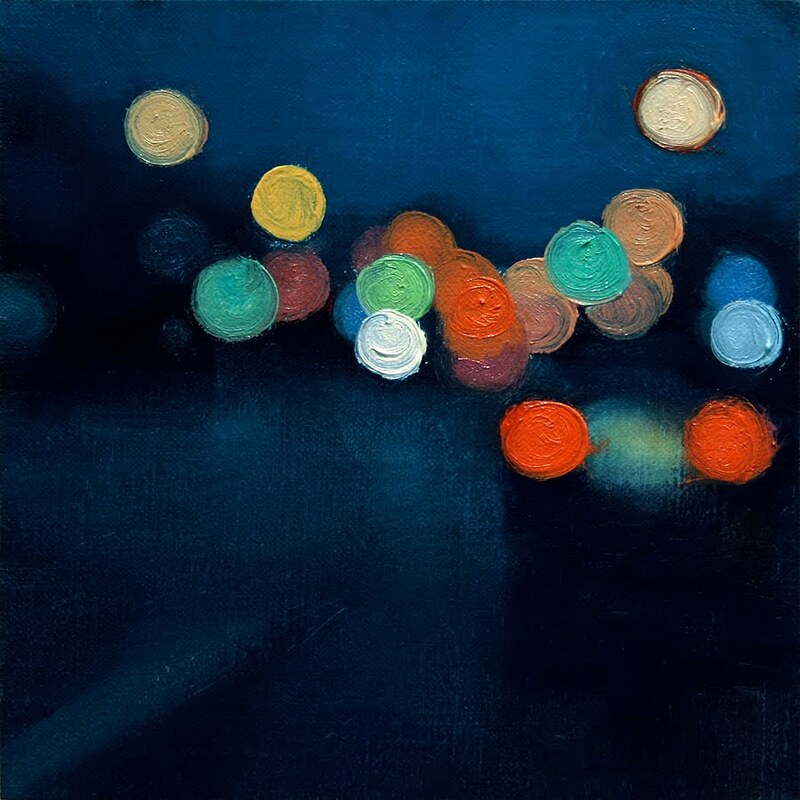 The Citylight paintings really look magical when you see them from across the room.